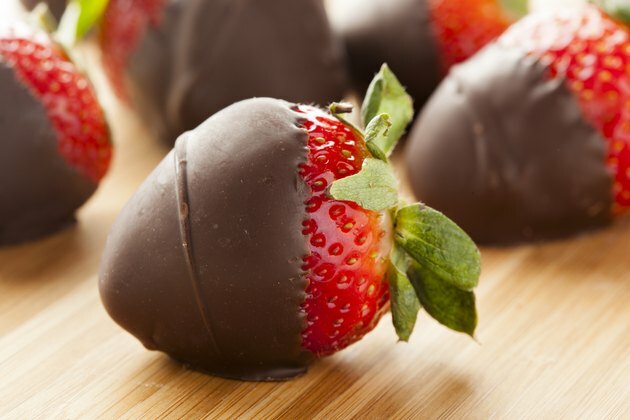 Chocolate-covered strawberries can be a healthy way to get a chocolate fix without consuming too many calories. You'll also get a nutrient boost from the strawberries, which are high in vitamin C. The exact number of calories in this treat will depend on the type of chocolate, the size of the strawberry and on the amount of chocolate you use to dip the strawberry. You can melt half of an ounce of semisweet chocolate and dip three medium strawberries in it for just 75 calories, but this amount of chocolate won't totally cover the strawberries. Dark chocolate-covered strawberries have about 57 calories per large strawberry, or about 105 calories for two medium strawberries. Double dipping your strawberries in semisweet chocolate increases the calories to about 63 per strawberry. A large strawberry dipped in white chocolate and sugar has about 75 calories.